The Carex E-Z Lock raised toilet seat has an easy-to-use locking mechanism that secures the raised seat to the toilet bowl. The smooth contour seat has built-in hand grips for easy handling and is lightweight and easy to clean. Handles must be attached to the seat and are cushioned and adjustable. The width between the handles adjusts from 18" to 20". The product dimensions are 15 1/2" x W 17" D x 14 1/2". 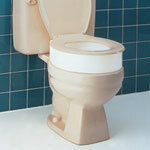 The raised toilet seat supports 300 lbs. and adds 5" in height to the toilet bowl. The product weight is 5.6 lbs. This raised toilet seat offers flexibility in small bathrooms since one or both handles can be removed for space requirements. Assembly required.